Thread: Quite a good shot? Well I thought this was a damn good shot, not by me. 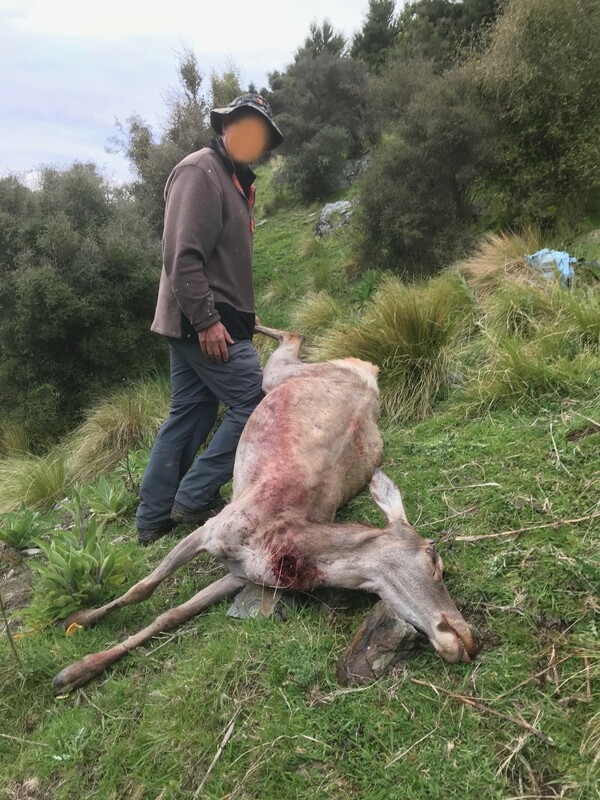 A mate took this hind across a gully at 398m double-checked by rangefinder before and after the shot. 6.5x55 T3, factory SST 130g (I think), 12x scope. Just a field shot off his backpack, animal was side on, he centred his 400m holdover reticle on her shoulder and windage took it onto the neck. Impressive exit wound I thought, the smear on her side is where she slid down headfirst over her blood trail. Bernie, Dublin, oneshot and 3 others like this. More a lucky shot. A good shot would have landed where it was aimed. Still, the BBQ doesn't tell the difference. BRADS, nevereadyfreddy, Nickoli and 5 others like this. That looks like a solid looking beast. takbok, xtightg and dannyb like this. Good to see the wind drift took the pill to safe kill or clean miss outcome. As pro golfers say - make sure you miss on the high side. @luckey That looks like a "Bruzzer" of a shot! Last edited by Fireflite; 05-11-2018 at 10:39 PM. Can’t conplain with that result. Did your mate forget to hold for wind or was it just stronger than expected? Could be that he did allow for the wind and achieved a great neck shot ! A lot of meat on that beast. Well done to the shooter. In a civilized and cultivated country, wild animals only continue to exist at all when conserved by the sportsman. The excellent people who protest against all hunting, and consider sportsmen as enemies of wildlife are wholly ignorant of the fact that in reality the genuine sportsman is by all odds the most important factor in keeping wild creatures from total extinction. To be fair @luckey from your description your mate should have your forum name... he was lucky and so was the deer, that was probably only an inch or two from a bit of a disaster. That’s a good 8-9mph wind maybe more depending on angle to get the bullet to shift that much at 400m, probably a 8-10” hold for windage. Just guessing the numbers but yeah, glad it was an emphatic kill. All times are GMT +13. The time now is 03:44 PM.